The Department of Hawaiian Home Lands developed a draft Water Policy Plan and is seeking your mana‘o and feedback. 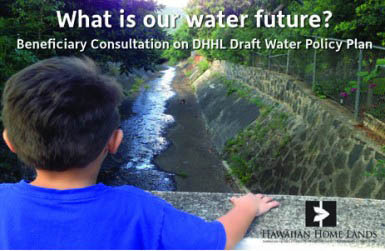 The draft document is available for review and comment at dhhl.hawaii.gov/po/water. We are conducting a series of statewide Beneficiary Consultation Meetings on the draft plan on the following dates and locations. All meetings are from 6:30 p.m. to 8:30 p.m. 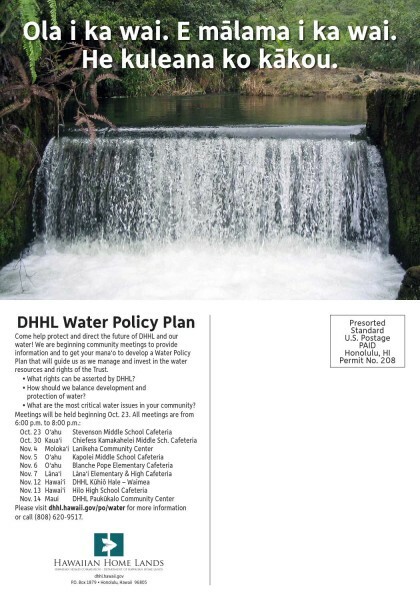 Please visit dhhl.hawaii.gov/po/water for more information or call the DHHL Planning Office at (808) 620-9517. Our vision is that there will be adequate amounts of water and supporting infrastructure so that homestead lands will always be usable and accessible, to enable us to return to our lands to fully support our self-sufficiency and self-determination in the administration of the Hawaiian Homes Commission Act (HHCA), and the preservation of our values, traditions, and culture. Come help protect and direct the future of DHHL and our water! We are beginning community meetings to provide information and to get your mana‘o to develop a Water Policy Plan that will guide us as we manage and invest in the water resources and rights of the Trust. What rights can be asserted by DHHL? How should we balance development and protection of water? 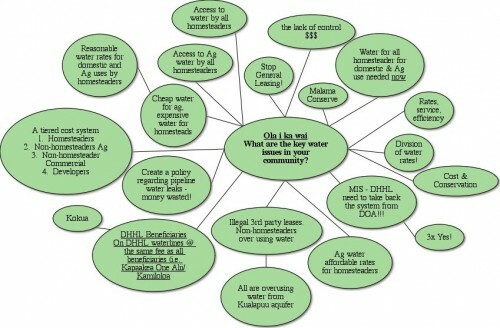 What are the most critical water issues in your community? 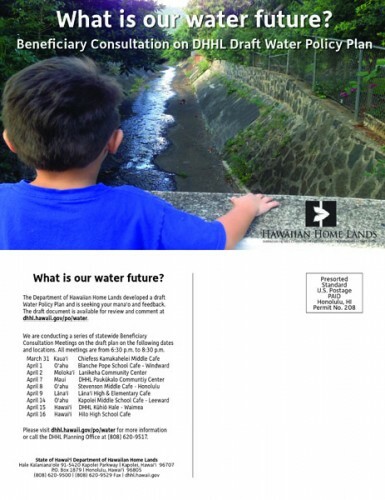 Please visit dhhl.hawaii.gov/po/water for more information or call (808) 620-9517. For more information, please visit dhhl.hawaii.gov/po/water or call (808) 620-9517.